As co-founder and publisher of De Correspondent, a Dutch journalism platform that broke the world record in journalism crowdfunding and now has 28,000 paying subscribers (€60 p/y), I’m spending a lot of my time working on our content management system called Respondens. On this blog I’m publicly researching our competitors and inspirations. Here’s my WordPress review. For my research on other content management systems, head to this collection page. For context: I’ve used WordPress since 2006. In 2010, I led the transition from Escenic to WordPress for Dutch quality newspaper NRC Handelsblad‘s nrc.nl (traffic doubled in 2011). The non-profit blogging software WordPress.org – free open source CMS that you can download and then install on your own server or host with a third-party. Everything you create, is yours. You’ll also have to take care of security, software updates and the capacity to cope with high volumes of traffic. The for-profit blog host WordPress.com – runs on the open source software and offers users to host a blog on the WordPress.com servers. It’s free, but for specific services like custom CSS, custom domains and ad-free, a user has to upgrade. 23 percent of all websites run on WordPress and sites hosted on WordPress.com alone hit 131 million unique visitors per month. WordPress has started out as simply a blogging tool, but has grown into a full-fledged content management system, particularly because custom post-types were introduced in 2010, allowing users to use the CMS for more than just posts and pages (such as products or portfolio entries). WordPress’ overall mission is to ‘democratise publishing‘, said founder Matt Mullenweg to The Guardian in 2013. He aims for ‘seventy to eighty percent’ of the web. Matt Mullenweg (1984) and Mike Little (1962) launched the blogging software in 2003. In 2005, Mullenweg founded Automattic, which owns WordPress.com and several WordPress extensions such as spam filter Akismet and social networking tool BuddyPress. The company now has 297 employees, who can decide for theirselves where in the world they want to work. WordPress.org is part of the WordPress Foundation. Mullenweg also has his own investment vehicle, called Audrey Capital, with which he invested in companies like WPTavern (a WordPress news outlet), Typekit, RescueTime, AngelList and several Bitcoin companies. Automattic has raised $317.3 million in five rounds from thirteen investors. In May 2014, the company raised its most recent round ($160M) and was valued at $1.16 billion. The open source software is available as a free download on WordPress.org. Setting up a blog on WordPress.com is free, but it charges extra for specific services. WordPress.com offers a VIP service for enterprises, which starts at $1,250 a month for a self-hosted site or $5,000 if you’d rather host it with them, and offers services like Site Review ($55,000), Plugin Reviews ($5,000) and Theme Reviews ($25,000). 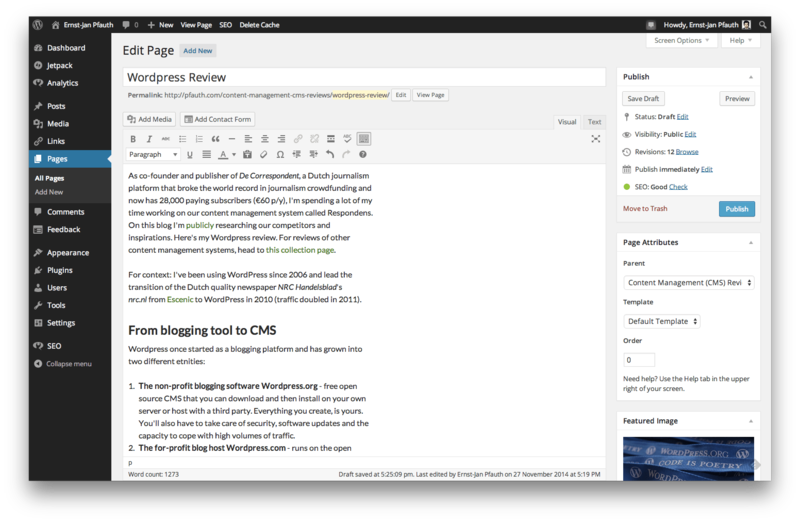 Screenshot of this page in the WordPress 4.0 editor. Click for larger view. And, yes, Beyoncé and The Rolling Stones. It’s easy to start a WordPress blog. Incredible network of developers who are constantly building and updating themes and plugins. Good resources for themes are WooThemes, ThemeForest, Smashing Magazine and the official Free WordPress Themes directory. Browse plugins here. This community also organizes 346 WordPress meetups called ‘WordCamps‘ in 172 cities across 48 countries. Matt Mullenweg regularly attends. 22 percent of the world’s websites run on WordPress. It’s like owning a Toyota Camry: there are always enough spare parts and mechanics who know how to handle the engine. Google seems to LOVE WordPress. Complicated admin UI, too many menu options. It’s not easy to focus for an author and the design doesn’t get you in the mood for writing (but maybe that’s personal). With BuddyPress, it is possible to offer readers/ members a profile and social network features, but WordPress isn’t specifically built for this. It’s more focused on one-way magazines with a comment section below articles. The comments and trackbacks are pretty spam-sensitive. Akismet catches most of it, but sometimes it misses a volley of spam messages. The WordPress iOS app suffers from a lot of ‘failed uploads’ when I’m updating a story. This has been going on for years. I quoted extensively from an interview with Mullenweg by FastCompany: How Matt’s Machine Works. Dedicated WordPress hosting company Kinsta published a guide to the history of WordPress. It’s a bit jubilant, but does offer a comprehensive list of WordPress companies and organizations. Want to let someone or an agency develop and design your WordPress site? Read this post first: How much should a custom WordPress site cost? Scott Berkun worked at Automattic for a year and wrote a book about it: The Year Without Pants: WordPress.com and The Future of Work (2013). You’ll find a summary of his findings over at PandoDaily. Tom McFarlin – this one is for the techies, since McFarlin writes about WordPress development (in a personal and pleasant way). WPTavern – covers the international WordPress community and its conferences and meet-ups. In 2011, WordPress CEO Matt Mullenweg purchased this blog and hired three writers to keep it up to date. WPLift – this blog is a little heavy on the Themes updates (you only need one theme, right?) but it often highlights good plugins and tutorials and features interviews with notable people from the WordPress community. Post Status – irregular updates for WordPress professionals, often insightful. I hope you’ve enjoyed this WordPress review! I’ll keep updating this page. Last time I did was on November 27th, 2014. Let me know through Twitter or the comments form if you have any questions or suggestions and subscribe to the RSS feed for further updates.